The part which holds the bezel onto your wrist is called the strap, band or bracelet of your watch. How Many Types of Wrist Straps Are there? When it comes to wrist straps you might have noticed just the Metallic or Silicon type of straps the most. But there are quite a lot of wristbands around. 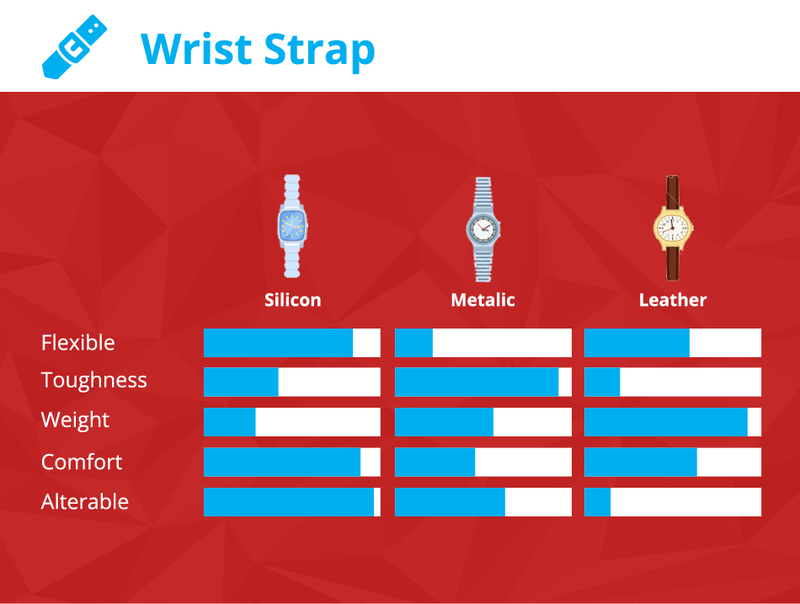 The most common are Leather, Silicon and Metallic straps. Alternatively, some companies have also made Synthetic, Paracord, Cloth-Style. Which Watch Strap Is best? There is not a definite answer for this as there are a number of factors which make a strap the best. It all depends on the priorities. For someone, the comfort might be the most important factor while for others durability is not to be compromised on. Some want a sweet combination of durability, price, comfort. How Many Style of Straps are there? Straps come in wide variety of style. In fact, different manufacturing material can produce different styles. For instance, leather comes in Classic leather, Rustic leather, Racing leather, Cuff leather etc. Similarly, you must have observed Mesh Style Metallic or Chained Metallic look. Some go even further to go with woven cloth build. It all depends on personal preference. You will observe loads of different styles but will get amazed that each which you neglect every other day has a special name. How to adjust or alter watch wristband? Wristwatch straps may be changed in terms of their length. Some watches may allow you to change the strap all together but if you are stuck with just one strap and it does not fits on your wrist then you have to alter its length. It is best done with metallic bans or even with plastic or synthetic bands. For leather bands, you will need more equipment to close of the exposed cut nodes. How to remove links from a stretch watch band? We made a special section for this mainly because this is a tricky process. If you can afford then let experts do this for you. However, if you are willing to learn then you will need some tools a bench knife, tweezers preferably non-magnetic and thin nose plier. Use a bench knife to pry fours tabs from each side of the strap. You need to remove the clips in shape of alphabet ‘U’ from both ends of straps from where you are prying. Remove the link i.e. both top and bottom part of the link. The link is composed of two upper and lower lid. This method separates both parts so you cannot let on remain in the chain as that would be meaningless. Repeat the process until all the links are removed according to your requirements. Once you are done make sure that you use the U shaped clips to hold back onto the C shaped claps. This has to be repeated on both ends of the straps. Once you are done stretch the strap/band again. It the job is well done, the strap will remain in place. If it is done incorrectly then you will observe that there is some gap in the part where you made the joint. What is the heaviest wristband? As a general rule of thumb is that Metallic wrist straps are the heaviest because metals are denser than the other materials used in manufacturing. But you will be surprised to know that some manufacturers use aluminum to make the bands lighter than the alloys used generally. Definitely, there is an allergy to literally anything. Some people may develop dermatitis because of exposure to metallic wristbands. If you are allergic to wristbands then you can consult your local skin specialist and he may recommend you NATO style plain wristband watches. Where to buy watch band? There are loads of websites available on the internet which provide custom made straps for your watch. You can simply do a google search or you may check Watch-Band-Center which specialized in wristwatches bands. Where to buy replacement watch bands? If you want replacement band it is better to get back to your manufacturer and get the original piece. If you to save money than you can try to make your own watch strap but that would require expertise. How To Measure Watch Band? IF you are planning to order a new watch strap. Then you need to make sure that you measure the distance between the two lugs on your watch. The distance has to be in centimeters or millimeters. Measuring the distance in centimeters is analogous to measure your hand in kilometers. The unit is too big than the object itself, therefore, you need a smaller unit to measure the object which in this case is centimeters or millimeters. Once you have the lugs measurement you can ask for standard strap length to your manufacturer provided that you are an adult. How to make watch band? If you want to step up your game and make your own band. Buy leather or synthetic flap as this is where it all begins. Let’s assume that you bought leather flap, measure the lug and cut two separate lengths bands. Measure your wrist now. After you are done with that now cut the strap whose width is equal to lugs in two sizes greater than your wrist size. One is longer while the other is shorter. You can keep a different of an inch between the two. Now make holes in the strap for stitching work as per your style. Attach buckle hardware and then punch buckle holes. Attach the straps to the face via lugs and you are done. Wristwatches have sensors in them. More sensors a wrist watch has higher it will be priced. 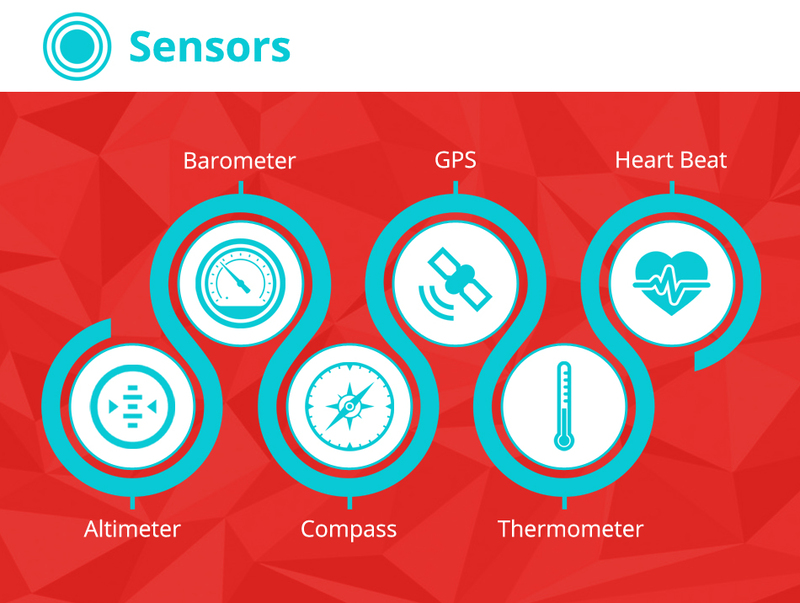 It’s important to understand what the sensors mean and how they work. This helps in evaluating if the included sensor is something you really need or it is an unrequired feature. Root word ‘alt’ means high. So it is an indication that it is used to measure how high or what is the altitude. A watch which has a sensor to measure what is the altitude is an altimeter watch. Altimeter determines the approximate altitude you are at by the help of getting inputs from the pressure change measuring sensor. So your watch barometer outputs are taken in by the altimeter which helps in determining the altitude. Before starting a journey if you set the altimeter to exact altitude helps it in giving further precise results during the journey. Root word ‘baro’ means pressure or weight. Therefore, the barometer is a sensor that measures the difference in atmospheric pressure. What is a barometer watch? A watch which has the capability to measure pressure difference is known as barometer watch. An increase in pressure on barometer indicates that the weather will remain stable. However, a sharp decrease in pressure is an alarm of an upcoming weather shift typically heavy rainfall. The readings provided by the barometer are passed on to altimeter helps in measuring the altitude the user is standing in. What is a compass watch? A compass helps in determining the magnetic north of earth. This helps in getting whereabout of where the future journey should move towards. 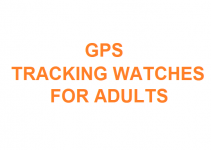 If you watch has a compass in it than you can do better navigation coupled with GPS. GPS or Global Positioning System is the coordinate system. Every point on earth as longitude and latitude associated with. GPS gives the pinpoint location of where the sensor is currently at. These days watches are coming with Global Positioning System integrated onto them. 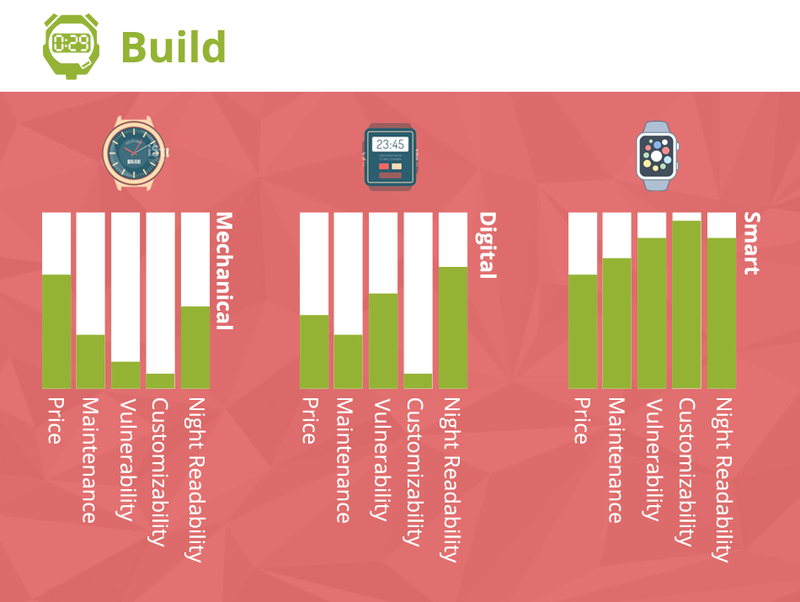 It is more common in smartwatches than mechanical or traditional digital watches. Thermo means ‘heat’ therefore a watch which has the capability to measure the atmospheric temperature is thermometer watch. The temperature change on the watch is also an indication of an upcoming change in weather conditions. What is Heart Beat Senor Watch? Most smartwatches these days can measure the heartbeat. The accuracy of data provided by the heartbeat sensor watch, however, is still debatable. How does Heart Beat Sensor Watch work? There are multiple LEDs under the wrist watch face with green light sensors. Blood being red in color absorbs green light and reflects back the red light. The sensors at back measure the dip in the green light which is faster during the heartbeat and slower during the non-beating phase. The difference helps in measuring how fast or slow the heart is beating. What is Shock Sensor Watch? Some high end watches come with an additional sensor to register sudden shock waves. Specially gunshots are identified by these sensors and data is fed into the GPS of the watch. For tactical watches users, this is helpful as they can identify later with pinpoint accuracy which point of the journey was best for hunting. There are a bunch of ways batteries are powered. Three sources are considered to be the main power source. Each has its own influence on the watch itself. The price of the watch also gets affected by the choice of power source. The watch infographics power section depicts exactly that. What are solar powered watches? Wrist timepiece can be powered by solar panel incorporated on the head of the watch. It absorbs sunlight and the electronic lying under the panel absorb the energy from light and convert it into the minute current in watch’s circuit. How to charge a solar watch? Solar watches get charged by the sun as a primary source but you will notice that they can get charged with interior lights as well. But the rate at which they get charged by the sun is significantly faster than the artificial light source. 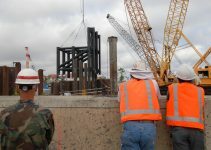 How long solar watch last? Solar timepieces power lasting depends on the number of functionalities it is meant to perform. If he watches has different kinds of sensors with it then it will lose power quite quickly but if it is only meant to tell time than it will last much longer than that. Ideally, solar wrist clocks tell time for a longer time than mechanical wrist watches. How to Fix Solar Watch? IF you are an expert in electronics especially in solar panels than you will find it a piece of cake to fix a solar watch. But if you are not an expert then it is better to give the watch to an expert who will fix it for you. In most cases, the solar panel needs to be changed. The internal wiring requires some neat skills to reconnect the new panel. How Expensive are Solar Watches? Solar watches start from under 10 dollars to anywhere above 1000 dollars. It depends upon the other features offered by the manufacturers. 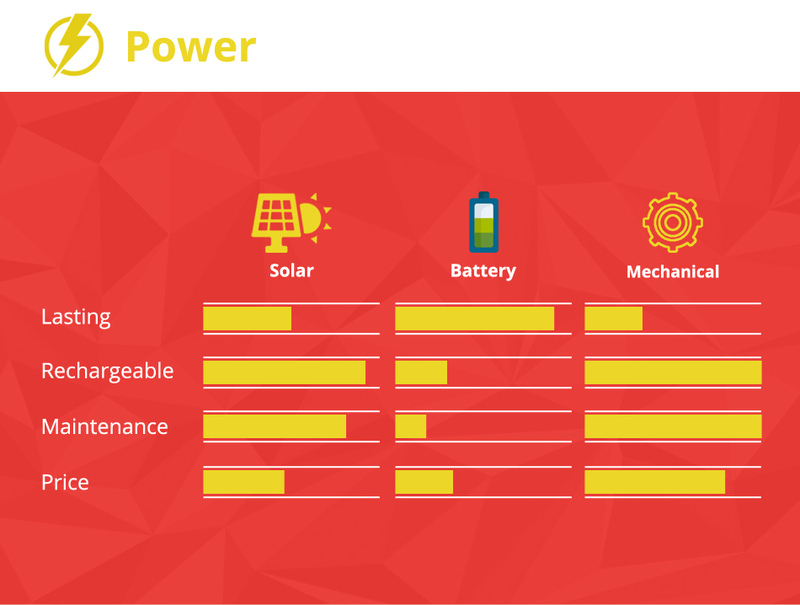 But if same features are offered in two watches and they only differ in terms of power than you will notice that Solar watch is priced higher than a battery powered watch. What are battery powered watches? Battery powered watches are the most common type of timepieces today. The interior circuit works by a small circular cell. With the passage of time, the battery loses it juice and you need to replace them. How long Battery watches last? It depends on the number of functionalities in the watch. If it is a GPS watch then it will use a lot of battery juice. Such watches require replacement or recharging after a week or in some cases with in few days. However, if there are no extra functionalities on the watch then expect it to last for few years. How to charge Battery of these watches? If you bought a high-end battery-powered watch than the charges apparatus will come with the watch. Usually, you can connect the watch to the computer and auto charging will begin processing just like the smartphone. Some manufacturers offer cable charging for the watches. But if it is a simple battery watch than you should simply replace it. How to fix Battery Watches? You need to find out what is the problem first. In 99% of the cases, such watches stop working because the battery has expired. All you need to do is open the watch back and replace the cell. It should be a straightforward task. Just make sure that you are using the same voltage as it was in the previous cell. How is Price of Battery Watches? Battery watches are cheapest when compared to other power source timepieces. It is because cells are easily available and there are many manufacturers who are making the cells. No special circuitry is required, or maintenance skills are required therefore these watches are prices lowered. These are the high-end watches and have everything working mechanically in them. These require high expertise level for manufacturers. One of the most prestigious timepieces on the planet is mechanical watches. How long Mechanical Watches Last? Mechanical watches work on winding principle. You have to wind a key which stores the energy in form of potential energy. As watch operates the stored potential energy act as a power source which drew power while winding the watch. They last much lower than solar or battery powered watches. How to charge Mechanical Watches? As soon as the winding is completed the watch becomes static. You have to rewind it to make it back alive. This is a drawback of mechanical watches but the value it offers in terms of manufacturing expertise shadows this lapse. How to Fix Mechanical Watches? Although you should not get into a problem with these watches. If you do get into such a problem then do not open this watch. Just sent it back to the manufacturer and get it repaired. Doing it by yourself, you may break it all together and things may get worse. What is the price of Mechanical Watches? These are the most expensive watches. They are priced much higher than any other type of watches. Manufacturing one takes months of work while the other simple type of wrist timepiece can be produced in bulk. The expertise level required to manufacture such watch is much higher than any kind of watch. 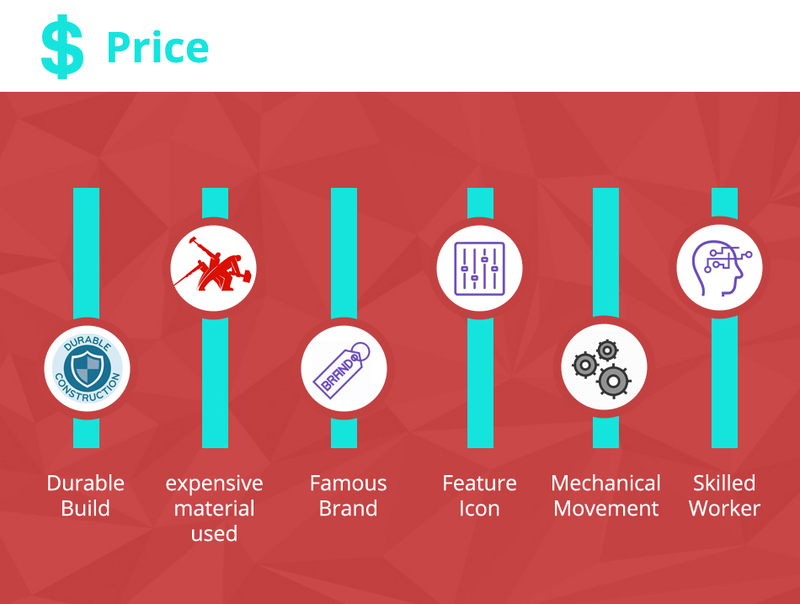 Price of wrist watches is influenced by a number of factors. A watch seemingly ordinary might be priced much higher than you may have perceived looking at it. This can be due to different reasons contributing significantly towards the watch price. Manufacturers are striving hard to make watches that are lightweight and strong. Stainless Steel: A common misconception is that steel is iron. It is actually an alloy made up of Iron, Carbon, Nickel and Chromium. It is one of the most common materials for watches because it gives watch lightweight and make it corrosion resistant. Ceramic: Ceramic watches are new into the market. The material is quite old but its inclusion as watchmaking material is still relatively new. Titanium: Another lightweight and stronger than steel watches. It makes the watch quite expensive. Gold: Another lightweight option for watches. Considered to be a luxury choice and obviously quite expensive. Plastic: Probably the cheapest manufacturing material for watches. Plastic watches are not long lasting but for the low price, they perform pretty well. Resin: These are non-repeating units of usually organic compounds if existing naturally. It can be modified to give different fancy looks. They are different from plastics as their composition is not uniform while that of plastic is repeating. Leather: Another most common material for wrist watches. The price can vary from few bucks to thousands of dollars. The high price can be because of exotic leather used in straps. Wood: One of the most common material available and it takes very little amount to make the wooden strap. But they are difficult to maintain and weaker than other common material. Therefore, you will find them at a much more reasonable price. Silicone: This rubber is one of the most common types of material used in watches straps and faces build. It is stretchy and very comfortable and has found its place as one of the most affordable and durable materials for timepieces. Carbon Fibre: One of the strongest material for a watch to be made of. Manufacturers specializing in this material are able to produce one of the finest watches with the very Modern look and finishes. Watches giving the same functionality but there might be an astounding difference between their prices only because of the brand names. There is a long list of famous watch brands whose price tags may shock you. There are a number of features that can alter the price of a watch. Sensors play a vital role in defining class of a watch. We have discussed some of the sensors already in this article. You might be interested in scrolling up again and re-read the sensors sections then decide for yourself if the price given by the watch with its features is justified or not. There are different movements a watch uses to tell time. Some have mechanical while others have quartz. Some watches operate solely digitally. A mechanical watch price will be much higher than others because it is totally handmade and requires years of training and hard work to produce such skilled workers which are able to manufacture a 100% mechanical watch. With the advent of smartwatches, generally speaking, there are three ways in watches are build. One is pure analog or mechanical, second is semi-digital while the third is pure digital or smart watches. If you have a mechanical watch, the reading from it can be a challenge in low light. However, if the dials are made of glowing material than this short back can be recovered. In case of the digital watch, there is a small LED light that glows the screens so you can read the result. While Smartwatches have a touch screen like a mobile phone which makes night reading almost perfect. It’s a significant factor because watches that are meant to be worn outdoors especially military tactical watches should have a clear night readability. If there is poor vision than a watch may have great sensors coming along with it but at night it will become useless. Everything nowadays asks for some flexibility. With smartphones, the expectation from an average product has risen. In case of watches, you can not customise different features of watch unless you have a smartwatch which can enable you to install different apps as per your likings. For Digital watches coming with silicone bands, customisability is almost none. While analog watches which come up with usually stainless steel or leather straps you can customise the strap part and do some more fashion definition. Imagine swimming with a smartwatch or dropping it from your table. Well, your day will not end well if that ever happens to you. The smartwatch would probably die soon. In the case of the digital watch, your watch may survive the water or some hard impacts but still, that is a near miss case in case of contact with water. For analog watches, water is almost of little importance. They are also designed to absorb shocks. They are least vulnerable when it comes to potential damages. By maintenance, we mean how much is it going to affect your pocket to keep a watch. In case, of the mechanical or digital watch in most of the cases, all you need to do is to replace the battery and you are good to go. If you watch is damage you can also get it repaired at considerably less cost. But if you have a smartwatch, if it stops responding then expect to pay a heavy bill to get it repaired. Generally speaking, mechanical watches with their high end 100% handmade watches raise the average price of mechanical watches significantly when compared with that of Digital watches. Smart watches have become quite common over the years and their price has also become more affordable. But the low-end models are very inefficient and still, there is massive room for improvement in them. Smartwatch made by Apple although is great but you have to pay a good invoice for it. Watches are often labeled as Water resistant and Water Proof. You will also read that the watch can go as low as 30 – 200 meters in water. It means that the degree of seals in the protection of watch joints are quite stronger. Watch with 200-meter ability to resist water has stronger than that of 30 meters. How Long can I keep water in depth? You cannot keep water in high depths for a longer period of time. Keeping it lower for long duration results in too much pressure. Especially because the act of swimming increases the pressure and seals will break open under such prolonged tremendous pressure. Watches with no seals at joints make them susceptible to water. Such timepiece should have no contact with water at all. Can I use the waterproof watch in the hot shower? Another interesting fact is that watches are made waterproof for cold water only. If you expect that you can take a warm shower with your watch on then it’s not a good idea. 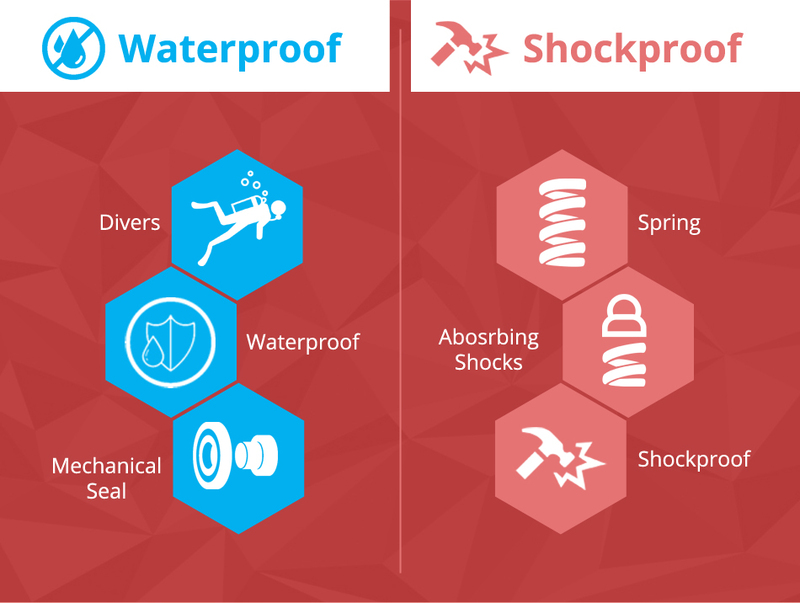 Another resistance when it comes to watches is shockproof. These watches have springs located at pivots or joints. This helps in absorbing the shock wave of an impact. How to check if the watch is shockproof? There is a standard way of knowing if a watch is shockproof or not. The watch is hammered by pendulum motion. The hammer weight should be 3kg and it should have an impact speed 4.43 m/s. After the impact clock should be able to keep its time within a minute difference for a day. 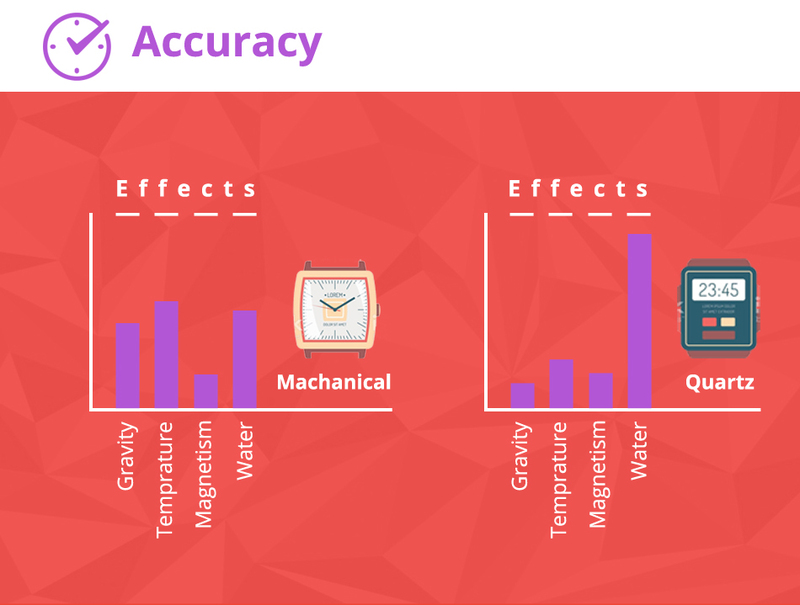 How Gravity affects Time Keeping? Gravity plays a significant role in altering the time. Mechanical watches are affected the most. You will be surprised to know that different position on dials and orientation of your hands effects the mechanical watch timekeeping differently. For some position, the watch will lose and in other positions, the watch will gain time. In comparison, the digital watches do not have the too much interdependent mechanical parts that may pressurize to change time. Therefore, Quartz watches are much better in keeping time. As the temperature rises the mechanical parts of the analog watch will undergo expansion. Similarly, as temperature decrease, the watch will contract. This affects the efficiency of the watch timekeeping ability. Because the inner parts are already very small you may think that the expansion and contraction should be very less. Well if you consider the change in size in comparison to already the very small size of inner parts than the ratio is quite significant to affect time maintaining ability. In contrast, mechanical watches have inner parts that can be affected by intense heat. Such as the watch face may melt especially if it is made up of plastic. The heat going inside can damage the inner circuit making the watch total useless. But intense high temperature is very rare unless you are planning to cross Sahara. Mechanical watches face the least effect of water because they can recover from that. The water finding its way in can cause the inner part to slip or may make the parts move faster. Water going in the load end may increase load and cause few milliseconds delay in each minute. Digital watches or Smart Watches cannot withstand water challenge. They may malfunction or in the worst case lose time. Both mechanical and digital watches have metallic parts. Under the influence of strong magnetic forces, your watch can behave abnormally. Especially the motor drive systems come under the influence of magnetism and can cause your watch to show inaccurate time. In such, a case you should consider demagnetizing your watch. You can contact your manufacturer they can help in the demagnetization process.